A short 50 minute flight from the island of Tahiti, the island of Bora Bora, with a lagoon resembling an artist’s palette of blues and greens, is love at first sight. Romantics from around the world have laid claim to this island, where the castle-like Mount Otemanu pierces the sky and sits as the centre-piece. 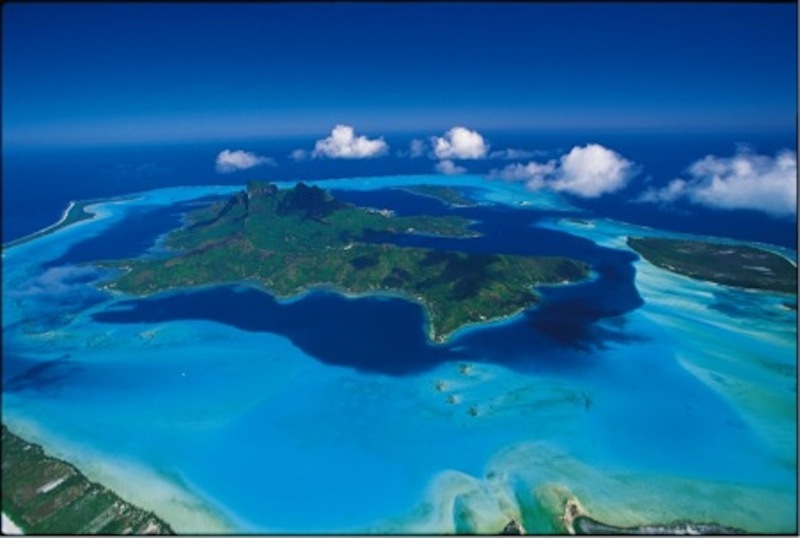 Bora Bora is synonymous with romance and is home to the iconic ‘Overwater Bungalow’. The vast choice of resorts, all as spectacular as the next, makes it the perfect honeymoon destination. From the dramatic scenery to the privacy and amenities of the overwater bungalows, everything in Bora Bora equals a 10 on the romance scale. Resorts have been welcoming couples for over 40 years and their special amenities have been fine tuned to perfection. From sunrise to sunset, each resort has designed their own blend of unique romantic experiences for their guests to choose from. Lush tropical slopes and valleys blossom with hibiscus, while palm-covered motu circle the illuminated lagoon like a delicate necklace. Perfect white-sand beaches give way to emerald waters where coloured fish animate the coral gardens as they greet the giant manta rays. This could easily be described as the centre of the romantic universe, where luxury resorts and spas dot the island with overwater bungalows, thatched roof villas, and fabled ambience. An array of land and water activities are on offer, or opt for peace and tranquillity in your own overwater bungalow/villa with that someone special. If you are looking for a sophisticated romantic escape and appreciate a high standard of accommodation and cuisine then Bora Bora is the right place for you.